"Nightshade is a book with many characters but not once will you be confused. Paranormalcy is a very VERY absorbing paranormal read with a great protagonist. The Eternal Ones will really make you believe you've lived in a previous lifetime. Halo, with Christian references, will make you want to be an angel. And Pegasus will introduce you to a world full of wonder and magic. 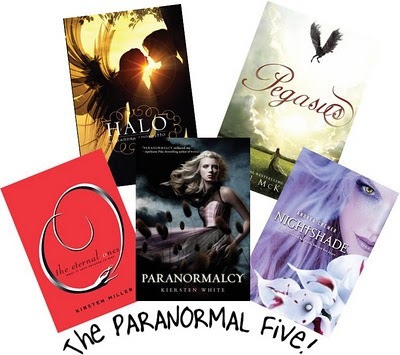 And with these five books, come FIVE packets of 5 Gum! Why? 'Cuz there's one flavor (kind of) to mirror the color of the book...and I LOVE 5 Gum!"